Upcoming Netflix feature film from writer/director Alan Yang. Hey, wanna be a in a movie? 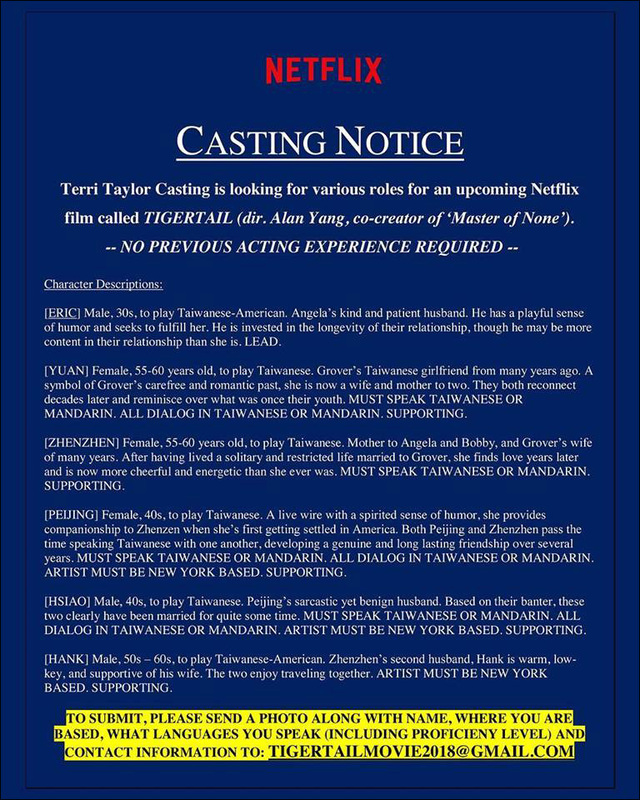 This casting call, currently circulating on social media, is looking for Taiwanese and Mandarin-speaking actors of various ages to star in the upcoming Netflix movie Tigertail, written and directed by Alan Yang. No previous acting experience is required. A quick and dirty internet search for TigerTail comes up with this synopsis: "After a hard childhood growing up in Taiwan, Grover takes a risky opportunity to move to America with a woman he doesn't connect with to start a new life, abandoning his love and a home he genuinely loved. He looks back on this decision throughout his life, perhaps stubbornly, especially as he sees his daughter Angela grow up to be a stubborn woman herself. Grover and Angela don't realize how similar they are, but eventually come to understand each other as they experience regret and failure, but enough happiness to keep moving on." Yang is best known as the award-winning co-creator of Master of None, and as a writer and producer for NBC's Parks and Recreation. The film's title, "Tigertail," appears to be a reference to Yang's own family origins. In a 2015 Fresh Air interview, he mentioned that his father hailed from a small village in Taiwan called TigerTail. [ERIC] Male, 30s, to play Taiwanese-American. Angela's kind and patient husband. He has a playful sense of humor and seeks to fulfill her. He is invested in the longevity of their relationship, though he may be more content in their relationship than she is. LEAD. [YUAN] Female, 55-60 years old, to play Taiwanese. Grover's Taiwanese girlfriend from many years ago. A symbol of Grover's carefree and romantic past, she is now a wife and mother to two. They both reconnect decades later and reminisce over what was once their youth. MUST SPEAK TAIWANESE OR MANDARIN. ALL DIALOG IN TAIWANESE OR MANDARIN. SUPPORTING. [ZHENZHEN] Female, 55-60 years old, to play Taiwanese. Mother to Angela and Bobby, and Grover's wife of many years. After having lived a solitary and restricted life married to Grover, she finds love years later and is now more cheerful and energetic than she ever was. MUST SPEAK TAIWANESE OR MANDARIN. SUPPORTING. [PEIJING] Female, 40s, to play Taiwanese. A live wire with a spirited sense of humor, she provides companionship to Zhenzen when she's first getting settled in America. Both Peijing and Zhenzhen pass the time speaking Taiwanese with one another, developing a genuine and long lasting friendship over several years. MUST SPEAK TAIWANESE OR MANDARIN. ALL DIALOG IN TAIWANESE OR MANDARIN. ARTIST MUST BE NEW YORK BASED. SUPPORTING. [HSIAO] Male, 40s, to play Taiwanese. Peijing's sarcastic yet benign husband. Based on their banter, these two clearly have been married for quite some time. MUST SPEAK TAIWANESE OR MANDARIN. ALL DIALOG IN TAIWANESE OR MANDARIN. ARTIST MUST BE NEW YORK BASED. SUPPORTING. [HANK] Male, 50s-60s, to play Taiwanese-American. Zhenzhen's second husband, Hank is warm, low-key, and supportive of his wife. The two enjoy traveling together. ARTIST MUST BE NEW YORK BASED. SUPPORTING. 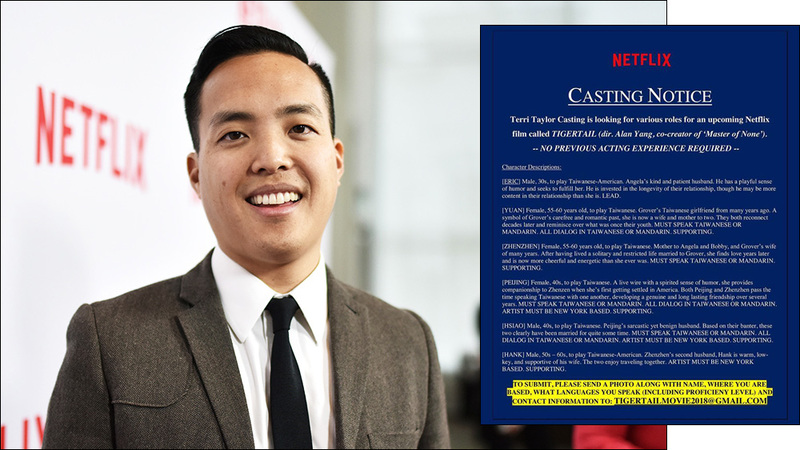 It explicitly says no acting experience is necessary. This seems like a decent opportunity for your Taiwanese mom and dad or aunt or uncle to finally share their hidden, untapped talent. Who knows what could happen? Also: we are excited that Alan Yang is making a movie.